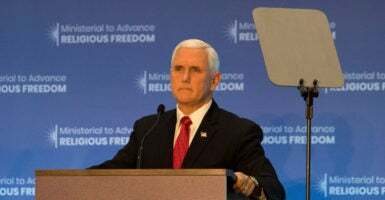 Vice President Mike Pence called out Turkey for imprisoning a Christian pastor and criticized Nicaragua for its attacks on the Catholic Church in a speech Thursday, where he also announced the Trump administration’s agenda to protect religious freedom. “A stunning 83 percent of the world’s population live in nations where religious freedom is either threatened or even banned,” the vice president said at the Ministerial to Advance Religious Freedom. Held at the State Department, the conference convened religious leaders and rights advocates from around the world to discuss the challenges facing religious freedom. Pence took swipes at familiar abusers of religious liberty and some unfamiliar regions where it’s rarely noted. Here are seven key points the vice president made. Pence announced two major Trump administration policies, the Genocide Recovery and Persecution Response Program and the International Religious Freedom Fund. He denounced the crumbling Islamic State for a “savagery unseen in the Middle East since the Middle Ages,” for the Sunni militant group’s brutal actions against Christians, Jews, Muslims, and particularly brutal treatment of Yazidis. Pence explained winning in combat is not enough, and the administration has committed $110 million to help persecuted religious groups rebuild. Under the Genocide Recovery and Persecution Response Program, the State Department and the U.S. Agency for International Development will partner with local faith and community leaders to deliver aid to persecuted communities, beginning with Iraq, Pence said. The administration is also kicking off an international effort to prevent religious persecution abroad, called the International Religious Freedom Fund. Earlier Thursday, President Donald Trump threatened sanctions against Turkey for jailing an American Christian pastor, Andrew Brunson, 50. After a year and a half behind bars, Turkey transferred him to house arrest. The United States will impose large sanctions on Turkey for their long time detainment of Pastor Andrew Brunson, a great Christian, family man and wonderful human being. He is suffering greatly. This innocent man of faith should be released immediately! 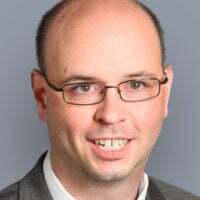 Turkish law enforcement arrested the pastor in 2016 on the charge of “dividing and separating” Turkey as part of a large-scale crackdown of thousands after a failed coup. He faces up to 15 years detention. “To President [Recep Tayyip] Erdogan and the Turkish government, I have a message on behalf of the president of the United States of America: Release Pastor Andrew Brunson now, or be prepared to face the consequences,” Pence said to applause. Pence talked to the pastor’s wife, Norine, on Wednesday. The pastor’s daughter, Jacqueline, was in the audience at the State Department event Thursday. Pence also hit closer to home. “Here in our hemisphere, in Nicaragua, the government of Daniel Ortega is virtually waging war on the Catholic Church,” Pence said. Pence noted that 350 Nicaraguans have died in the cause of freedom this year. Trump met with North Korean leader Kim Jong Un in June and with Russian President Vladimir Putin last week. During his speech on religious freedom, Pence criticized both countries. Regarding Russia, Pence noted how the Putin government has treated Jehovah’s Witnesses. The vice president also raised concerns in an unexpected continent. In 2017, hate crimes against Jews were on a record high in Britain, Pence said. Meanwhile, he noted Jewish leaders in France and Germany have warned religious adherents not to wear religious identifiable clothing. In Iran, where the Trump administration recently withdrew from a multilateral nuclear deal, Pence talked about oppression by the Shia majority. In 2016, Iranians arrested 20 Sunni Kurds on the charge of “waging war against God,” for practicing their beliefs that didn’t conform with the Iran regime’s beliefs, Pence said. The State Department has labeled China, the world’s most populous country, as a religious freedom violator every year since 1999. “Together with other religious minorities, Buddhists, Muslims, and Christians, are often under attack,” Pence said. He referred to a Buddhist monk in the crowd who has faced religious persecution, and then went on to talk about the Uighur Muslims, a group of Muslims concentrated in Asia. “Beijing is holding hundreds of thousands and possibly millions of Uighurs Muslims in so called re-education camps, where they are forced to endure around the clock political indoctrination to denounce their religious beliefs and their cultural identity,” Pence said.